Agnes Studios & Apartments Enjoy a sun filled holiday in Corfu by booking your stay at the comfortable and attractive Agnes Studios & Apartments. The Agnes Studios & Apartments are situated in a peaceful garden area close to the centre of the vibrant town of Kavos on the island paradise of Corfu. Located right next to the beach and close to the famous Kavos Jetty, this is a great hotel for couples and families with tastefully furnished studio and two-bedroom apartments featuring nicely equipped kitchenettes and providing a comfortable base from which to enjoy this lively area. Kavos is known for its crazy nightlife and the hotel is just a 150 m walk away from countless restaurants, bars, and clubs with live entertainment and all kinds of band music. Guests to the Agnes Studios & Apartments can discover marvellous beaches nearby and explore delightful little villages with a variety of restaurants and bars while relaxing in front of the most beautiful sunsets nature has to offer. For a memorable holiday in Corfu, Agnes Studios & Apartments make the grade. Corfu Airport is 38 km from the Agnes Studios & Apartments. The facilities the Agnes Studios & Apartments offer everything you need for a relaxing holiday. Food, drink and entertainment: The poolside bar is open 24hours and there is a restaurant and a bar that shows the latest sporting events including the World Cup games. Sports, games and activities: Swimming pool overlooking the sea, sun beds and umbrellas (small charge). Additional: 24hour reception mini market and safe deposit boxes. The Agnes Studios & Apartments feature well appointed spacious comfortably decorated guest accommodation fully equipped with full bathroom, air-conditioning (payable locally), kitchenette, hairdryer. Extra bedding, linen, towels, ironing facility and infant cots are available on request. Most apartments enjoy a furnished balcony/terrace offering views of the surrounding area/sea. Agnes Studios and Apartments is located right next to the beach and close to the famous Kavos Jetty. On the beach you will find sun loungers and parasols and a variety of water sports. 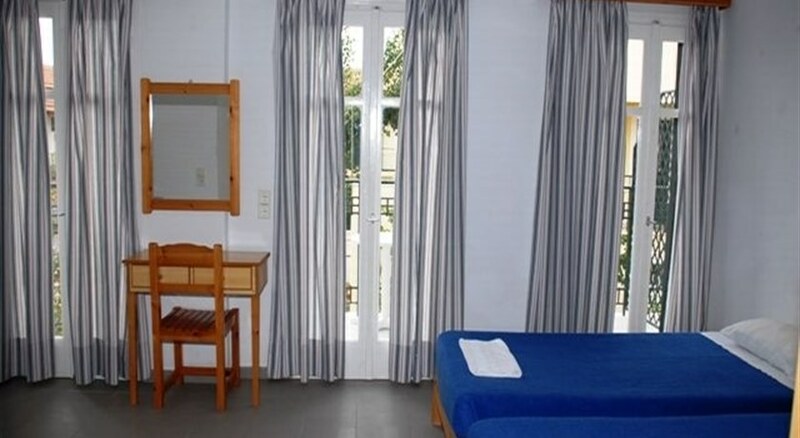 The complex is set in a peaceful garden area, minutes away from Kavos centre. The main strip is just 150 metres away. On the main strip you will find lively bars and nightclubs, countless restaurants and a wide variety of entertainment options. Kavos has some of the most beautiful sunsets. Whilst watching the sunset you can explore the local villages. Nearby is Kassiopi, a well known fishing village which is dominated by an ancient fortress built by the Roman Emperor Nero. Corfu Airport is 38 km away.